A 60-year old man is being investigated under the suspicion that he had embedded toothpicks in public bus seats, according to a report in The Straits Times Online. Singapore police said in a statement that they received a report from the management of a bus company on August 4, saying that one of its passenger seats on their bus was perforated with toothpicks. Pictures of three toothpicks sticking out of a red bus seat had made their rounds on social media in late July. 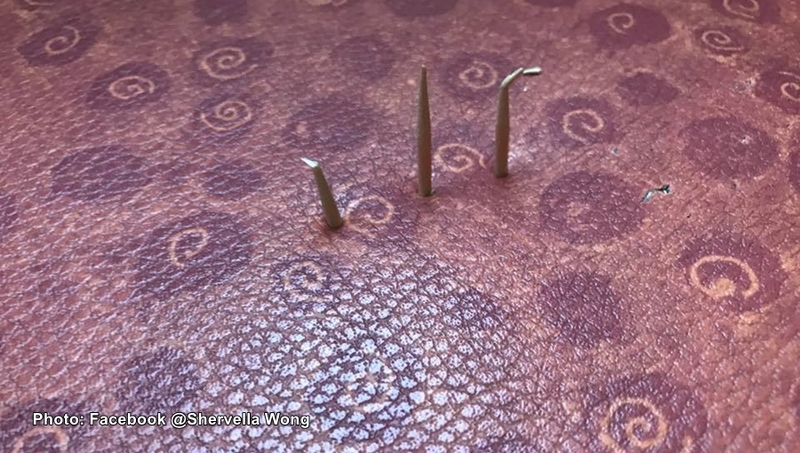 Singapore-based Facebook user Shervella Wong posted on July 22 saying she got on the bus and found toothpicks sticking out of the seat. “I just don’t understand, the person who had done this have the time to get toothpicks and stick it in the seat trying to get people injured,” she wrote. Sometimes, EVERYONE is tired before and end of the day and definitely too tired to check their seats before sitting…. Officers from TransCom and the Clementi Police Division conducted extensive investigation and referred to closed-circuit television footage which helped identify the suspect. Investigation against the suspect is under way and, if convicted, he can face a jailterm of up to two years and/or a fine.